Dimensions: 4.25" X 7" X 0.25"
In the 1960's, a French nurse, Marie Carre, attended an auto-crash victim who was brought into her hospital in a city she purposely does not name. The man lingered there near death for a few hours and then died. He had no identification on him, but he had a briefcase in which there was a set of quasi-autobiographical notes. She kept these notes and read them, and because of their extraordinary content, decided to publish them. Marie Carre was a French author, nurse and convert from Protestantism in 1965. 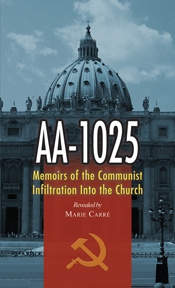 Her dramatized memoirs, entitled AA-1025: Memoirs of the Communist Infiltration Into the Church, were originally published in 1972 as ES-1025 by Editions Segieb, France. The English edition was printed in 1973 by Editions St. Raphael, and later republished by TAN in 1991. The work is comprised of various biographical notes that the author obtained from a Communist who entered the seminary with the intent of subverting the Church. Marie Carre died in 1984 at Marseilles, France.